We had visited the church and the cemetery (see posts – which I have not yet posted) and were looking for some place for lunch. 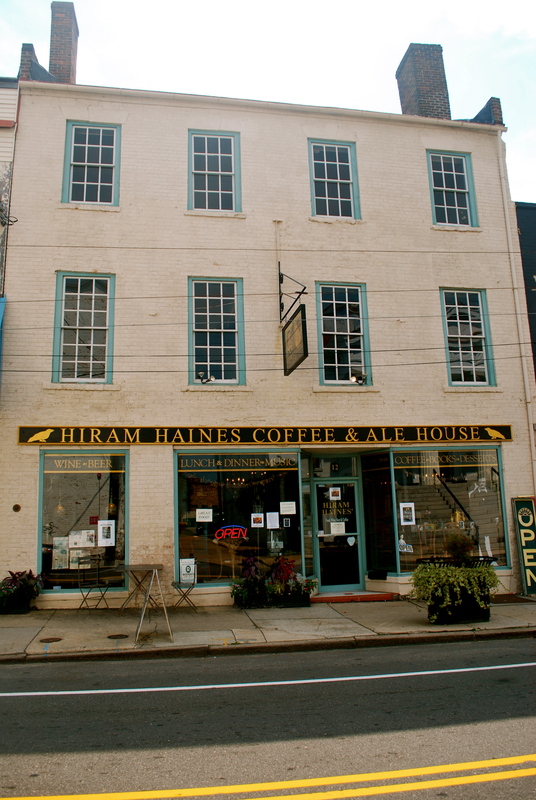 As I looked down the list of Petersburg, Virginia places to eat – I noticed the Hiram Haines Coffee and Ale House. What was interesting about Hiram’s was that this where Edgar Allan Poe spent his honeymoon days with his 13 year old cousin, Virginia. Not that I had ever thought about where Poe had spent his honeymoon and I’m sure Sue hadn’t either … but so be it – it had something to do with literature … so we headed to Hiram Haines. Seems that Hiram was a poet and editor of the American Constellation and had met Poe because of their literary connections … and Haine’s wife and Poe had grown up together and were good friends. So when Poe was looking for a place to take his new wife – he ended up at Haine’s Petersburg resident/sometimes newspaper office/sometimes hotel. Anyhow – that’s where we had lunch. The place is quirky, filled with Poe memorabilia and books … lots of books. Books line the walls from top to bottom. Stuff hangs from ceilings (like a chair) and a raven sits over the front door. You can buy t-shirts and mugs … and coffee. So, we enjoyed a rather, unexpectedly different type of lunch – that was a lot of fun.